Hello friends and foes of three speeds! Ever since I created Society of Three Speeds over five (five!) years ago, I had hoped to create something like the Lake Pepin Three Speed Tour here in the Northwest. 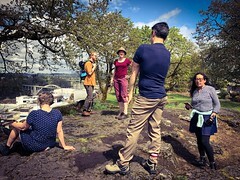 Maybe not something exactly like Pepin, but something in a multi-day format that explored the countryside. And for five years, I have been racking my brain for something appropriate, something that would have that mix of nice roads, scenery, services, and (most importantly) not a lot of hills. And finally, I think I may have hit on something close to my goal. Something that has been sitting in front of me for all that time: The Willamette Valley! Okay, I have thought of something in the valley for a long time, but I had been thinking of custom two day loops that would start and end in the same spot. Why don’t I just use something that’s already there? And that “already there” is the Willamette Valley Scenic Bikeway, a 135 mile back road route stitching many of the points of interest in this region via fairly flat, low traffic roads. Sold! So this is an inaugural test of this route via three speeds. 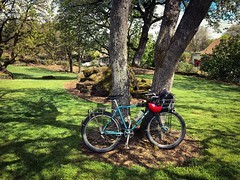 I’ve ridden the Willamette Valley Scenic Bikeway before, back in 2009, but that was with my Long Haul Trucker. I know barely a month is not the most notice, and summer is a busy time. But maybe you can join me? And if this is successful, I hope to do it again next year, maybe Labor Day, maybe some other three day span during nice weather. And this will be a LEISURELY tour. We’ll emphasize the experience. We’re not concerned about “making good time”, and we’re going to be on three speeds so we ain’t gonna be fast! Expect some meandering, lots of stops, and breaks for food and beer. Day One (Sat 1 Sept) will consist of riding through Salem to Independence, approx 40 miles. (If you decide to take Amtrak to Salem, you can meet us here.) We should have a good break for food and beverage in Salem. We’ll camp in the Riverview Park in Independence, which has a bicycle camp site. Day Two (Sun 2 Sept) will consist of riding from Independence through Albany to outside Shedd, approx 40 miles. (You can depart ride at Albany and take Amtrak home from here.) We should have a good break for food and beverage in Albany. If time allows, we may detour into Corvallis. We’ll camp at a rural and primitive property in Shedd. Day Three (Mon 3 Sept) will consist of riding from Shedd to Eugene, approx 30 miles. We should have a nice dinner in Eugene. Depending on how early we get into town, you may be able to take Amtrak home that night. However, we can crash with Three Speed Tim for the night. Or, you can camp at Armitage Park outside of town, stay at the Whiteaker Hostel or other lodging facilities. If you decide on those options, you will be responsible for making reservations. I’d encourage you to book NOW, as it can be a busy weekend. I’ll be taking Amtrak home on Tues Sept 4. Maybe you will, too? Please note that booking Amtrak tickets is your responsibility, and there are only 10 bike spots per train. The sooner you book, the better. Campsite in Independence is $10 per site. We may need one to three sites, split up appropriately. Plan for a meal break on Saturday in Salem, Sunday in Albany, and Monday in Eugene. These will probably be at brewpubs. There may be other stops. We should be making dinner at the campsites. We’ll stop for groceries at some point on the ride. If you choose to stay somewhere other than the “official” spot on Monday night, you’ll be responsible for all fees and you’ll need to book it. Amtrak Cascades trains from Eugene to Portland can be as low as $25 ($20 for seat, $5 for bike) if you book far enough in advance. The closer we get to Labor Day Weekend, the higher the ticket price will be. Also, if you decide to use the Coast Starlight train, bike fee is $20. Book as soon as you can, trains and/or bike spots can sell out. Only 3 through 5 speed hub geared bicycles allowed! Sorry, no exceptions. You must carry all the gear on your own bike. There will be no “sag” wagon or vehicle support. Nor can you cheat by asking your friends, family, spouse, significant other, etc. But don’t worry, there will be several opportunities for resupplying on the way. 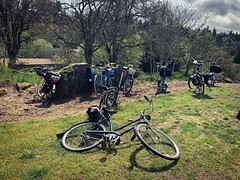 There are free showers at Champoeg. Independence and Shedd will not have shower facilities, so be prepared for this! There may be a bit of dirt/gravel roads and paths on this trip. Your three speed can handle it. If you haven’t done so yet, now may be a good time to lower the gearing on your three speed. If you have never swapped out the rear cog, you can go with a larger toothed one (22 inch) which will lower the overall gears. Fantastic! I’m looking forward to this being a great success, and being repeated. I think you have a brilliant plan. Hopefully, I’ll be able to do one of these.